DaE Sept 23 Afternoon – Attenzionen!!! In the afternoon September 23 1944 scenario the British 214th Infantry Brigade of 43rd Wessex Division start their attack on the town of ELST. They are supported by Sherman tanks from the 4/7 Dragoon Guards / 8th Armoured Brigade. 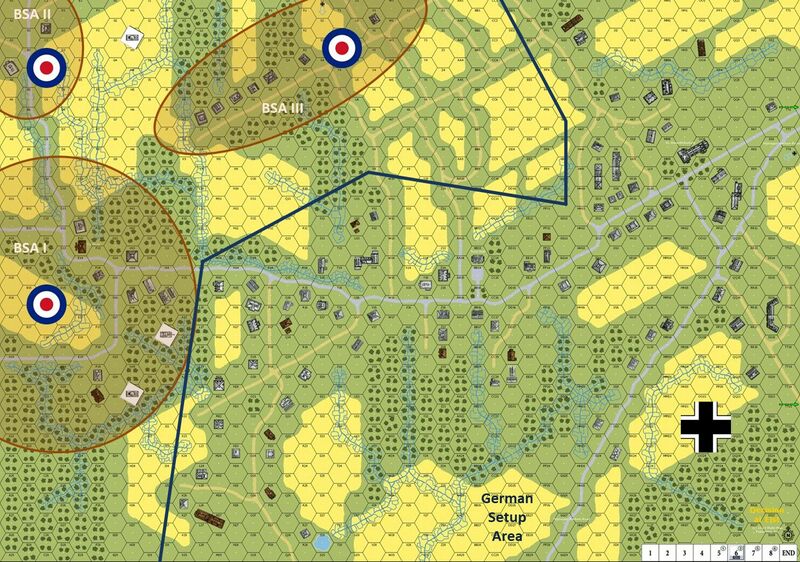 In my replay the British probe the German positions. Their main aim is to penetrate the main line of defence and to establish a base for further attacks towards ELST. This is to be achieved with minimal losses if possible. In the ensuing campaign game scenario the British secure the area around DE HOOP and also establish themselves in the build up area on the northern part of the map. The British loose 6.5 squads, a weapons crew, 3 Sherman tanks killed, and one Sherman tank recalled. This adds up to a British casualty rate of 28.5 % of the infantry and 66 % of the armour. From the eliminated MMC pool the British regain one 4-4-7 Squad. Also they receive 20 Campaign Purchase Points for replacements. With these they purchase an Infantry Company (8 CPP), a Tank Troop II (5 CPP), MG Platoon (5 CPP), and a 70+mm OBA. The Germans plan is to deny a fast British breakthrough along the VALBURG – ELST road. The German infantry is well supported be the two Pz V Panther tanks and succeeds in securing their main objective. Nevertheless the infantry takes the brunt of the fight suffering a staggering loss rate of 69 % including 50 % of their leaders killed or badly wounded. Six of the nine infantry MMC lost have surrendered due to failure to rout. The Germans regain two 4-4-7 SS Squads from the eliminated pool and 15 Campaign Purchase Points. They purchase a Volksgrenadier Company (4 CPP), a SS Infantry Company (6 CPP), a Pz III N Platoon (2 CPP), and an 80+mm OBA (3 CPP).